What is Between the World and Me about? It’s about how, in a bleak, blunt, literal sense Coates treasures the “black body” and urges his son to do the same. He says he learned this lesson from reading, among the many authors he names, (the pre-Hajj?) Malcom X. According to Coates’ interpretation of Malcom, the meaning of life for black people in America is not survival of the fittest but simply survival. The aim of life for Coates is to preserve and protect one’s life, nothing more. Throughout his book Coates repeatedly mentions, ridicules, and resents “the Dream,” a phrase that functions as a rhetorical device, referring both to Dr. King’s “Dream” speech and the general mythology of the American Dream. For Coates, to mythologize is to dream. To have hope in the face of counterevidence is to dream. Dreaming is but a mental illness that leads to death. Waking life means mental health. These are the lessons he asks his son to learn. I agree with his use of “the Dream” as a rhetorical device. To me mythology is also a form of dreaming. So is reading, for we are pseudo-conscious while we read and dream (as we learn in the first paragraph of Proust). All I do when I read is try to compare the things that stand out on the page at hand to things that have stood out on previous pages of previously-read books. So in my reading and in my dreaming, I find the focus on the body as articulated by Coates seems to agree with Martin Buber’s call for humanity to “tend with holy care the holy treasury of our actuality.”  It might seem strange to compare (the nearly agnostic?) Buber to the adamantly atheist Coates. Buber has been accused of not regarding the Shoah with enough diligence, while Coates is almost exclusively focused on the consequences of American slavery. But according to my dreams, as writers, both of them are engaged in philosophic anthropology—both strive to obtain a rigorous understanding of human culture. On the other hand Buber, who once declared “nothing can doom man but the belief in doom,”  might not have agreed with Coates’ fatalism that while the mind may dream the body can only die. Buber, Ich und Du. (I and Thou.) 1923. Translated by Walter Kaufmann. Scribner: NY. 1970. pp.136–37. Rubenstein, Richard L. “Martin Buber and the Holocaust: Some Reconsiderations.” New English Review. November 2012. An earlier version of this essay was presented in German at the Buber Centenary Conference in West Germany, 1978, chaired by the President of the Federal Republic of Germany, Walter Scheel. An earlier English version was published in The Michigan Quarterly Review, Vol. 17, No. 3, 1979. Buber, I and Thou. 107. As Ronan Fanning has pointed out, the homes of the Irish Republic were adorned with the triptych of Pope John XXIII, Robert and John F. Kennedy in the early 1960s, then the Unionist household gods were the king-emperor, William III, and––above all––Carson…. And this got me to thinking about how when I was growing up, I knew no one who had portraits of people other than their family members hanging on their home walls. No JFK, RFK, no Pope, no Queen, Ben Gurion, Che Guevara, no Ronald Reagan or Tom Landry. Chiam Potok’s novel The Chosen (1968) has a scene where the narrator remarks that for many American Jews, Roosevelt’s death “was like God dying”—recall the cover photo for Look Magazine that a young Stanley Kubrick shot and was awarded for. I do know a white American woman in her fifties who’s infatuated with the late Diana, my father once named a pet dog Stevie Ray Vaughn and another Bruce the Boss, and as an adult I once visited a Mexican–American woman’s house that held a shrine dedicated to Elvis. But, for the most part, such hero worship and its accompanying iconography is deeply unfamiliar to my personal experience. As Professor Proust teaches us, when we fall for someone––sexually, politically, philosophically, artistically—we imagine them. We image-make them. We make a portrait of them. And in doing so, we mistake the map for the territory it marks. His attention was not distracted by the report of individual events or momentary emotions, sympathetic comments enlightened him without embarrassing him, and he saw a picture of himself, not like a second self in a mirror, but a different self, one outside of him, as in a painting. One never approves of everything in a portrait, but one is always glad that a thoughtful mind has seen us thus and a superior talent enjoyed portraying us in such a way that a picture survives of what we were, and will survive longer than we will. You can’t imagine, because you aren’t in the trade, how an erroneous system of ethics can hamper the free development of one’s creative faculties. So nothing is further from my old novels than the one I am planning now. I used to demand logic and consistency from my characters, and in order to make quite sure of getting them, I began by demanding them from myself. It wasn’t natural. We prefer to go deformed and distorted all our lives rather than not resemble the portrait of ourselves which we ourselves have first drawn. It’s absurd. We run the risk of warping what’s best in us. Kokoshka has done a portrait of me. It could be that those who know me will not recognize me; but surely those who don’t know me will recognize me. Jackson, Alvin. “Unionist Myths 1912–1985.” Past & Present. No. 136. (August 1992.) 164–85 at 172. Potok, Chiam. The Chosen. NY: Simon and Schuster. 1967. Fawcett Crest Book reprint. June 1968. 177. Variance of a belief, annulment also of love, which, pre-existent and mobile, comes to rest at the image of any one woman simply because that woman will be almost impossible of attainment. Thenceforward we think not so much of the woman of whom we find difficult in forming an exact picture, as of the means of getting to know her. A whole series of agonies develops and is sufficient to fix our love definitely upon her who is its almost unknown object. Our love becomes immense; we never dream how small a place in it the real woman occupies. And if suddenly, as at the moment when I had seen Elstir stop to talk to the girls, we cease to be uneasy, to suffer pain, since it is this pain that is the whole of our love, it seems to us as though love had abruptly vanished at the moment when at length we grasp the prey to whose value we had not given enough thought before. What did I know of Albertine? One or two glimpses of a profile against the sea, less beautiful, assuredly, than those of Veronese’s women whom I ought, had I been guided by purely aesthetic reasons, to have preferred to her. By what other reasons could I be guided, since, my anxiety having subsided, I could recapture only those mute profiles; I possessed nothing of her besides. Since my first sight of Albertine I had meditated upon her daily, a thousandfold, I had carried on with what I called by her name an interminable unspoken dialogue in which I made her question me, answer me, think and act, and in the infinite series of imaginary Albertines who followed one after the other in my fancy, hour after hour, the real Albertine, a glimpse caught on the beach, figured only at the head, just as the actress who creates a part, the star, appears, out of a long series of performances, in the few first alone. That Albertine was scarcely more than a silhouette, all that was superimposed being of my own growth, so far when we are in love does the contribution that we ourself make outweigh––even if we consider quantity only––those that come to us from the beloved object. And the same is true of love that is given its full effect. There are loves that manage not only to be formed but to subsist around a very little core––even among those whose prayer has been answered after the flesh…. But apart from this, had the portrait been not anterior like Swann’s favourite photograph, to the systématisation of Odette’s features in a fresh type, majestic and charming, but subsequent to it, Elstir’s vision would alone have sufficed to disorganise that type. Artistic genius in its reactions is like those extremely high temperatures which have the power to disintegrate combinations of atoms which they proceed to combine afresh in a diametrically opposite order, following another type. All that artificially harmonious whole into which a woman has succeeded in bringing her limbs and features, the persistence of which every day, before going out, she studies in her glass, changing the angle of her hat, smoothing her hair, exercising the sprightliness in her eyes, so as to ensure its continuity, that harmony the keen eye of the great painter instantly destroys, substituting for it a rearrangement of the woman’s features such as will satisfy a certain pictorial ideal of femininity which he carries in his head. Similarly it often happens that, after a certain age, the eye of a great seeker after truth will find everywhere the elements necessary to establish those relations which alone are of interest to him. Like those craftsmen, those players who, instead of making a fuss and asking for what they cannot have, content themselves with the instrument that comes to their hand, the artist might say of anything, no matter what, that it would serve his purpose. Thus a cousin of the Princesse de Luxembourg, a beauty of the most queenly type, having succumbed to a form of art which was new at that time, had asked the leading painter of the naturalist school to do her portrait. At once the artist’s eye had found what he sought everywhere in life. And on his canvas there appeared, in place of the proud lady, a street-boy, and behind him a vast, sloping, purple background which made one think of the Place Pigalle. But even without going so far as that, not only will the portrait of a woman by a great artist not seek in the least to give satisfaction to various demands on the woman’s part–such as for instance, when she begins to age, make her have herself photographed in dresses that are almost those of a young girl, which bring out her still youthful figure and make her appear like the sister, or even the daughter of her own daughter, who, if need be, is tricked out for the occasion as a ‘perfect fright’ by her side—it will, on the contrary, emphasise those very drawbacks which she seeks to hide, and which (as for instance a feverish, that is to say a livid complexion) are all the more tempting to him since they give his picture ‘character’; they are quite enough, however, to destroy all the illusions of the ordinary man who, when he sees the picture, sees crumble into dust the ideal which the woman herself has so proudly sustained for him, which has placed her in her unique, her unalterable form so far apart, so far above the rest of humanity. Wilhelm Meisters Lehrjahre. (Wilhelm Meister’s Apprenticeship.) VIII, i, 309. Les caves du Vatican. (Lafcadio’s Adventures.) 1914. Translated by Dorothy Bussy. NY: Knopf. 1953. “V. Lafcadio,” ii, 195–96. The Picture of Dorian Gray. Lippincott’s Monthly Magazine. 1890. Barnes & Noble Classics Edition. 2003. II, 31–32. Cahiers = Notebooks. Vol. I. Translated by Paul Gifford et al. Edited by Brian Stimpson. Based on the French Cahiers edited by Judith Robinson-Valéry. (1912. H 12, IV, 726) [pp. 328]. Half–truths & one–and–a–half truths: selected aphorisms. Edited and Translated by Harry Zohn. Engendra Press: Montreal. Reprint Chicago UP. 1976. p. 42. Proust: the work of art is the mistress of the artist. People often say that, by pointing out to a man the faults of his mistress, you succeed only in strengthening his attachment to her, because he does not believe you; yet how much more so if he does! 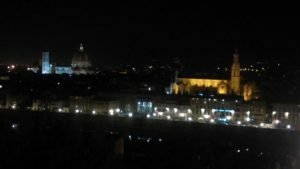 On our eighth day we left Roma in the late afternoon and arrived in Firenze (Florence) sometime after dark, maybe nine or ten. Here Chiara and Cosimo surprised Scott and me by driving up a hill on the south side of the Arno River called the Piazzala Michelangelo—a piazza that overlooks all of Florence and has copies of some of Michelangelo’s works, including a bronze David statue that is perhaps a fourth the size of the original marble. We took pictures, drank water and beer, and ate some pizza we had brought with us from Roma. We got back to Bologna around midnight. We mostly packed for home and took it easy on our last day in Italia, but in the afternoon we went to the local grocery store to get some things for dinner. I was surprised at how the layout felt so similar to any grocery store in the States. Same lights, floors, baskets, checkout procedures. We had a little going away party that night. Tosco came, along with Cosimo’s friend and Scott’s acquaintance, Raffaele, and another fellow musician named Domenico, who was from Crotone. We drank beer, played music from phones and 45s (the gang introduced us to the subgenre of Italo Disco), ate a roast wrapped in hog-jowl prosciutto which was then surrounded by dough (cooked together almost like a pot pie) with fried potatoes and bufala balls on the side. It was all very bon voyage and bon appetite. 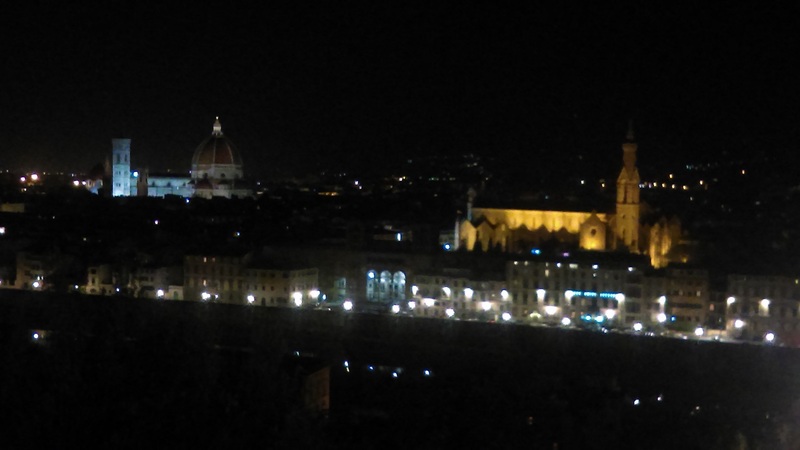 What moved me was the thought that this Florence which I could see, so near and yet inaccessible, in my imagination…. [Venice and Florence] became even more real to me when my father, by saying: “Well, you can stay in Venice from the 20th to the 29th, and reach Florence on Easter morning,” made them both emerge, no longer only from the abstraction of Space, but from that imaginary Time in which we place not one, merely, but several of our travels at once, which do not greatly tax us since they are but possibilities,—that Time which reconstructs itself so effectively that one can spend it again in one town after one has already spent it in another—and consecrated to them some of those actual, calendar days which are certificates of the genuineness of what one does on them, for those unique days are consumed by being used, they do not return, one cannot live them again here when one has lived them elsewhere. The places that we have known belong now only to the little world of space on which we map them for our own convenience. In the late afternoon we head south to Rome. In Florence, we encounter a major traffic jam on the A1 Highway, forcing us to detour over some back roads through Tuscany. We stop somewhere in a village south of Florence and have salami sandwiches, a bottle of Chianti, lemoncello. Some kids hear us speak English, so they rush up to our table to ask how one says “ciao” in the Anglo-Saxon tongue. An interesting day: breakfast in Bologna, late lunch in Tuscany, dinner in Rome (cold homemade eggplant pasta, freshly sliced strawberries, breads and cheeses (including gorgonzola) I believe). Rome has been in the tourist business for over two millennia, so it’s no surprise that I wake up in this city and–as our accommodations overlooked the Piazza della Rotondato and Pantheon–hear someone playing Leonard Coen’s “Hallelujah” (1984), then Ennio Morricone’s theme to “Once Upon a Time in the West” (1969), then Nino Rota’s theme to the “Godfather” (1972). Our excursion begins after some coffee and pastries. First, the Pantheon: a Roman Temple built by Hadrian in the second century and now a consecrated church that holds, among other things, the tomb of composer Arcangelo Corelli (1653–1713) as well as the crypt of painter Raphael Sanzio da Urbino (1483–1520). Next, Basilica di Santa Maria Sopra Minerva, consecrated in 1370, a church which immediately faces the southeast side of the Pantheon. Once inside we find that we happen to arrive at the right moment to see light shine through stained glass and illuminate the Madonna and Child Giving Blessings (1449) by Benozzo Gozzoli (1421–1497). Outside Sopra Minerva in the piazza stands a plinth holding an elephant that on its back supports an Egyptian obelisk. This is the Obelisco della Minerva, sculpted by Gian Lorenzo Bernini (1598–1680). 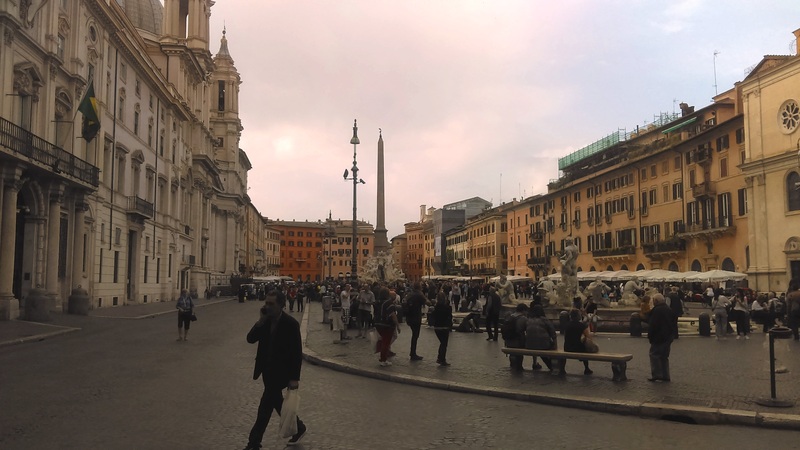 We then stroll a few blocks westward into the massive Piazza Navona––full of tourists, music, fountains and food. And, at some point we make our way to La Casa Del Caffe Tazza D’oro on Via dei Pastini and Via degli Orfani: a shop, according to Cosimo, considered by the native Romans to be one of the best places in the city for coffee. At evening we eat pizza at Al Forno della Soffitta near the corner of Via Augusto Valenziani and Via Piave. We are served appetizers of fried mashed potato balls, onion rings, olives stuff with prosciutto then fried like jalapeño poppers here in the States (except that all were battered in flour). Then, each of us is presented with an eighteen-inch pizza. All the pizzas have mozzarella, some with bufala (mozzarella made from buffalo milk). Scott’s is topped only with bufala and prosciutto. We are slightly mocked by our hosts for our slow intake of such fine cuisine. “You certainly don’t eat like Americans,” says one. After the pizza, we settle our stomachs via vehicular sightseeing: in the warm, Roman night we see the Coliseum, the Bocca della Verità (which I knew only from watching a scene in Roman Holiday), then the Basilica Papale di San Pietro (St. Peter’s Basilica) and the entrance to Vatican City, Trajan’s Column and later the Column of Marcus Aurelius. We also see the Italian Supreme Court building and the Chiesa del Sacro Cuore del Suffragio (Church of the Scared Heart of Jesus in Prati) whose neogothic architecture stands out in contrast to its more classical surroundings. Our night ends with a walk to the Trevi Fountain (which I knew only from watching a scene in La Dolce Vida). Here many late-night tourists take selfies, American frat boys wearing NBA jerseys chug wine from bottles tightly clenched, as Roman police supervise everyone and seagulls flying overhead and bathing in the fountain before us. We throw in coins, make wishes, and are now obliged to one day return to Roma. After celebrating a birthday brunch for Chiara’s mom Signora Rita with risotto, pasta, roasted chicken, pastries, cake, coffee, Chianti, bitters, we drive back to Bologna—but not before picking up some Roman pizza for the road (possibly from Pizza Zazà off of Piazza di Sant’Eustachio but I can’t remember exactly). Too much to tell…. words only fail…. One could live in Rome for two lifetimes and still not have time to explore it all…. 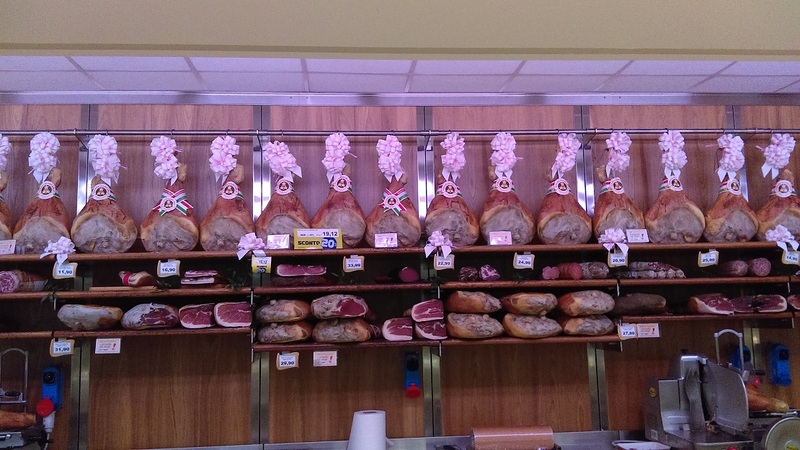 I need someone from Bologna who has written about Rome…. I need to imbibe Bolognese composer Ottorino Respighi (1879–1936) and absorb his symphonic poem “Pines of Rome” that those notes transposed might transcend and further ferment understanding my initial experience of the Eternal City. It was the steeple of Saint-Hilaire which shaped and crowned and consecrated every occupation, every hour of the day, every point of view in the town. From my bedroom window I could discern no more than its base, which had been freshly covered with slates; but when on Sundays I saw these, in the hot light of a summer morning, blaze like a black sun I would say to myself: “Good heavens! nine o’clock! I must get ready for mass at once if I am to have time to go in and kiss aunt Léonie first,” and I would know exactly what was the colour of the sunlight upon the Square, I could feel the heat and dust of the market, the shade behind the blinds of the shop into which Mamma would perhaps go on her way to mass, penetrating its odour of unbleached calico, to purchase a handkerchief or something, of which the draper himself would let her see what he had, bowing from the waist: who, having made everything ready for shutting up, had just gone into the back shop to put on his Sunday coat and to wash his hands, which it was his habit, every few minutes and even on the saddest occasions, to rub one against the other with an air of enterprise, cunning, and success. And again, after mass, when we looked in to tell Théodore to bring a larger loaf than usual because our cousins had taken advantage of the fine weather to come over from Thiberzy for luncheon, we had in front of us the steeple, which, baked and brown itself like a larger loaf still of ‘holy bread,’ with flakes and sticky drops on it of sunlight, pricked its sharp point into the blue sky. And in the evening, as I came in from my walk and thought of the approaching moment when I must say good night to my mother and see her no more, the steeple was by contrast so kindly, there at the close of day, that I would imagine it as being laid, like a brown velvet cushion, against—as being thrust into the pallid sky which had yielded beneath its pressure, had sunk slightly so as to make room for it, and had correspondingly risen on either side; while the cries of the birds wheeling to and fro about it seemed to intensify its silence, to elongate its spire still further, and to invest it with some quality beyond the power of words. Even when our errands lay in places behind the church, from which it could not be seen, the view seemed always to have been composed with reference to the steeple, which would stand up, now here, now there, among the houses, and was perhaps even more affecting when it appeared thus without the church. And, indeed, there are many others which look best when seen in this way, and I can call to mind vignettes of housetops with surmounting steeples in quite another category of art than those formed by the dreary streets of Combray. I shall never forget, in a quaint Norman town not far from Balbec, two charming eighteenth-century houses, dear to me and venerable for many reasons, between which, when one looks up at them from a fine garden which descends in terraces to the river, the gothic spire of a church (itself hidden by the houses) soars into the sky with the effect of crowning and completing their fronts, but in a material so different, so precious, so beringed, so rosy, so polished, that it is at once seen to be no more a part of them than would be a part of two pretty pebbles lying side by side, between which it had been washed on the beach, the purple, crinkled spire of some sea-shell spun out into a turret and gay with glossy colour. Even in Paris, in one of the ugliest parts of the town, I know a window from which one can see across a first, a second, and even a third layer of jumbled roofs, street beyond street, a violet bell, sometimes ruddy, sometimes too, in the finest ‘prints’ which the atmosphere makes of it, of an ashy solution of black; which is, in fact, nothing else than the dome of Saint-Augustin, and which imparts to this view of Paris the character of some of the Piranesi views of Rome. Andrew Butterfield writes on some Botticelli exhibits in Berlin: “Botticelli: Love, Wisdom, Terror,” May 26, 2016. Tim Parks writes on “How Italy Improved My English,” May 10, 2016. Matt Donovan discovers that tourists used to climb the Pantheon in “Climbing the Eye of God,” May 13, 2016. Sam Jordison of The Guardian writes about Delillo’s work, both old and new, in “White Noise is an outsider’s look inside small-town Americana,” May 17, 2016. Sarah Boxer of The Atlantic has an article “Reading Proust on My Cellphone,” June 2016. For critic Walter Benjamin (1892-1940), Proust’s involuntary memory is not based neither on one’s experiences nor the cues that trigger such involuntary memory. Instead, Proust’s involuntary memory is much closer to the act of forgetting. Proust’s syntax rhythmically, step by step, enacts his fear of suffocating. And his ironic, philosophical, didactic reflections invariably are the deep breath with which he shakes off the crushing weight of memories. One of the fundamental aspects of Proust’s style is his use of metaphor or images. He believed that beauty or truth can only be expressed obliquely and this is why he used clusters of images or strings of morphemes to focus on the truth by a sort of stylistic convergence…. Proust felt strongly, however, that books should not be approached as if they provided definitive answers to all life’s questions, as if they were Holy Writ…. Proust believed that reading as a spur to day-dreaming was one of literature’s most vital functions…. There is no glorification of speed-reading in Proust; for one thing, it would allow no time for day-dreaming…. Ellison, Ralph. Invisible Man. NY: Random House. 1953. (1947.) “Chapter 18” 294. Benjamin, Walter. Illuminations. NY: Schocken Books. Edited by Hannah Arendt. Translated by Harry Zohn. 1968. “The Image of Proust” 202. Benjamin, “The Image of Proust,” 213–14. Graham, Victor E. “Proust’s Alchemy.” Modern Language Review. Vol. 60, No. 2. (April 1965.) 197–206 at 199. Soucy, Robert. “Proust’s Aesthetic of Reading.” The French Review. Vol. 41, No. 1. (October 1967.) 48–59 at 49. Soucy, “Proust’s Aesthetic of Reading” 50. Soucy, “Proust’s Aesthetic of Reading” 59. We believe that we might, from childhood, have become a different person, lived a different life––We picture ourself being quite different. But the possibility of re-grouping the same elements in several different ways still remains––this calls into question how we see time. There’s no lost, past time, as long as these other persons are possible. What Proust aims at is a mental reconstruction of his past. He tries to recapture all the forgotten sensations that constitute his past life. In this ‘novel of memory,’ as his work has been called, the greatest innovation is Proust’s conception of memory itself. He maintains that, in reconstituting the past, it is not conscious memory but involuntary memory that is the most important factor. It is not the things we have always remembered of the past that keep the past alive in us, it is the things which, having been completely forgotten, are recalled in all their original vividness by some trivial sensation, and not by an act of the intelligence at all…. If we can only recapture the past by recapturing the actual sensation belonging to it, Proust concludes that our past joys and griefs are not always in our possession. But if by any chance we are brought into contact with the whole framework of sensations in which our past joys and sorrows are stored away, then these past sensations can again exercise a great power over us, because for the time being they instal [sic.] within us, as it were, the being we were at the time when they first affected us…. Valéry, Paul. Cahiers = Notebooks. Vol. I. Translated by Paul Gifford et al. Edited by Brian Stimpson. Based on the French Cahiers edited by Judith Robinson-Valéry. (1913. N 13, V, 92.) [p. 329]. Murray, J. “Marcel Proust.” The Modern Language Review, Vol. 21, No. 1. (January 1926.) 34–43 at 38. Miller, Henry. Tropic of Cancer. 1934. NY: Grove Press. 1961. VIII, 162–63.